09.24.15. Chicago IL. Loyola U FBC Next gen social @ Goose Island pub. Photo by Glenn Kaupert, © 2015. Illinois Family Business of the Year Awards: Winners and Finalists Announced! You’ve built a legacy within your business. Now what? For Bruce Boyd, the next step was pursing an “encore career” that explored new sectors and new passions. Read below for his insights on these transitions and a sneak peek of his session at our Legacy Conference on September 29! Did you miss our most recent conference on culture in family business? Check out a quick clip of Jude Rake, one of our speakers from the event, as he talks about some insight into why culture in family business is important. Our Next Generation Leadership Institute is kicking-off in 3 weeks (May 5-6)! For those of you who might be hesitant about taking the plunge or need to know more about the benefits of enrolling, we pulled together a list of reasons — check ’em out below and start filling out that application! 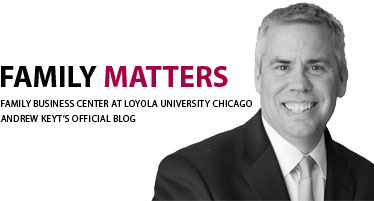 Welcome to the Loyola Family Business Center’s blog featuring Andrew Keyt, clinical professor in family business. This blog focuses on all things family business: leadership styles, family strategy, succession planning, managing family conflict, next generation development, and more. You’ll also find center news, events, and photos. For more, visit LUC.edu/fbc.